Hannibal-LaGrange University recognized the annual alumni award winners during the 2017 Homecoming Entertainment on Friday, September 30. The three awards were given to Don and Gerry Dehner ‘55, Bo Jennings ‘08, and Carole Jo Riley ‘63. 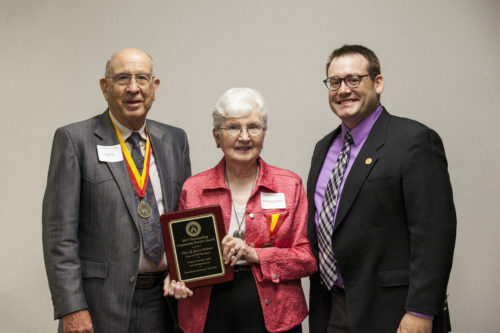 The Distinguished Alumnus Award was presented to Carol Jo Riley ‘63. This award is presented to an HLGU graduate for significant and broad accomplishments in business or professional life, or for state or nation. Born in Brookfield, Missouri, Riley received her associate of arts degree from HLGU in 1963. She then furthered her education by earning a Bachelor of Music in Piano Pedagogy from Oklahoma Baptist University, and a Master of Music in Piano Pedagogy from Peabody Conservatory of Music in Baltimore, MD. Upon graduation, Riley served HLGU for more than 40 years as an instructor of music theory and piano. She is a member of Music Teachers National Association, Missouri Music Teachers Association, and Sigma Alpha Iota. Locally, she is a member of Mark Twain Boyhood Home Associates and Hannibal Arts Council. 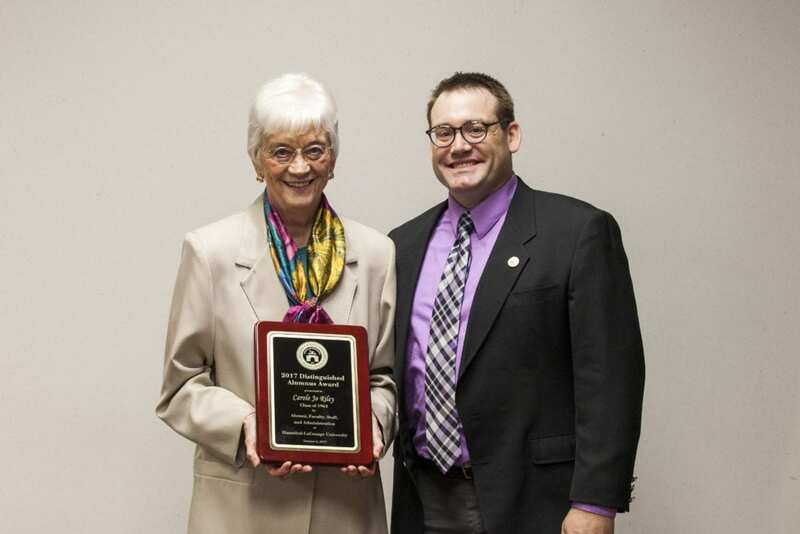 In 2013, she funded the Carole Jo Riley Endowed Scholarship which is awarded every year to a full-time HLGU piano or music major selected by the music faculty. An active member of Calvary Baptist Church, Riley is involved in many church ministries, including her service as a facilitator with GriefShare. After the unexpected death of her husband Jim Riley in July, 2012, Mrs. Riley said she benefited immeasurably from participating in GriefShare. Now she seeks to help others going through similar losses. Riley also maintains a personal interest in her former students whose friendships and accomplishments bring her great joy. The Outstanding Service Award was presented to Don ’55 and Gerry Dehner ‘55. This award is given to Hannibal-LaGrange graduates who have given outstanding service to the University or their community through involvement in civic endeavors, religious leadership, or philanthropic efforts. The Dehners were both born in rural Lewis County and graduated with their associate’s degrees in 1955. Don then went on to earn a bachelor’s degree from East Texas Baptist College in 1957, and a master’s degree from Northeast Missouri State University in 1967. Both Gerry and Don have served HLGU and their community well over the years. Don worked as a teacher at Frankford Elementary and Palmyra Elementary, and served as principal at Mark Twain Elementary and Oakwood Elementary in Hannibal. He also worked on the maintenance staff, as the student director, and as registrar at Hannibal-LaGrange. Gerry worked as Mark Twain Savings and Loan and Marion County Mutual before coming to HLGU and serving as receptionist in the business office for 30 years. The Dehners are members of Calvary Baptist Church, Missouri Campers on Mission, and Missourians on Mission. Don enjoys fishing and golfing, Gerry enjoys sewing, quilting, and participating in the shoebox ministry at church, and together they enjoy mission building and gardening. Don and Gerry have two daughters, Karen Hupp ’78 in Hampton, VA, and Dr. Beth Blanchard in Hartsburg, MO. The Outstanding Young Alumnus Award was presented to Bo Jennings ’08. 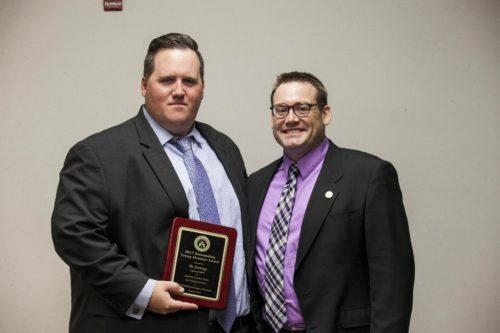 This award is given to a Hannibal-LaGrange graduate, who is age 35 or younger, for outstanding accomplishments in their profession, business, community, state, or nation. Born in Corpus Christi, Texas, Jennings received his Bachelor of Science in Liberal Studies from HLGU in 2007. Following graduation, Jennings served as a sales and events coordinator at Glorieta Convention and Conference Center, and director of catering and events at Chef’s Market. Currently, he is vice president of events and marketing at Cumberland Hospitality Group. He is also a guest lecturer at Belmont University for the event management certification program and has worked with large events such as the SEC Men’s Basketball Tournament and the Music City Bowl. Jennings is a member of Make a Wish of Middle Tennessee, Nashville Sports Council, Nashville Convention and Visitor’s Corporation, and is the brand champion of the southwest region and immediate past president of the Nashville chapter of International Live Events Association.